Doyle, Arthur Conan. The Adventures of Sherlock Holmes. Lit2Go Edition. 1892. Web. 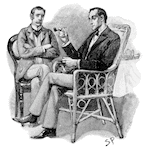 <https://etc.usf.edu/lit2go/32/the-adventures-of-sherlock-holmes/>. April 19, 2019. Arthur Conan Doyle, The Adventures of Sherlock Holmes, Li2Go edition, (1892), accessed April 19, 2019, https://etc.usf.edu/lit2go/32/the-adventures-of-sherlock-holmes/.